Which Credit Card To Use For Airline Ticket Purchases? Nowadays most airlines have co-branded credit cards which offer bonus points for tickets you purchase directly with them. That of course makes sense — they want you to be loyal to their brand in general (like using your co-branded airline credit card for non-airline purchases), but when you use their co-branded credit card for ticket purchases on them, they’re winning in two ways. However, there are some other cards that offer huge rewards for airline purchases as well. So under what circumstances should you use the airline’s co-branded credit card directly, and under which circumstances should you use another card instead? If you have one of the above cards, there are almost no circumstances under which I’d purchase an airline ticket with an American, Delta, Southwest, United, or US Airways card. It’s worth noting that nowadays co-branded airline credit cards give you (almost) entry level elite status benefits in many cases. You often get a free checked bag, priority check-in, priority boarding, etc. But for most airlines you don’t actually have to use the card for the ticket purchase in order to get those benefits. Instead the card just has to be linked to the frequent flyer account for the primary cardmember. There are some exceptions, but for most carriers that’s the case. Also keep in mind that if you purchase your tickets directly through Chase’s website, you earn an extra point per dollar, which is a nice extra “bonus” for tickets you’d purchase anyway. You also earn an extra point per dollar for airfare purchased with an American Express Card, though don’t earn 3x points if the card isn’t purchased directly with an airline. What’s your preferred credit card for airfare spend? While it's easy to get caught up in the miles & points world, it's nice to stop once in a while and remember what's truly important in life. I think it’s also worth noting that if you book through the travel sites (Amex of Chase), you get an additional point per dollar. I always forget about that when booking. Remember with the United card, you DO have to use the card to book the reservation in order to get the free checked bag. Ben, I generally agree with your analysis and tend to use the Chase Sapphire card the most in travel categories. I also like that you qualified your analysis with the phrase “… there are almost no circumstances under which I’d purchase an airline ticket with an American, Delta, Southwest, United, or US Airways card.” For me, the “exception” comes at the beginning of each year when the requalification cycle “resets” on for my Southwest companion pass (as you have noted the single most lucrative status perk out there). Then I open a SW credit card (I rotate between the business card and the general card annually), and maximize spend, including SW air fare, until I get the 110K RR points necessary to re-qualify for the companion pass through the subsequent year. Usually takes me about 3 months to get the required points, and then it’s back to Sapphire and other cards. My SW business card hasn’t seen a charge since mid-March. AmexPRG and Saphire have slightly different built-in travel coverages. I have both and use Sapphire based on my research of benefits – especially for international, multi-leg trips where lots can go wrong. Great piece–thanks! It would be a huge service to many of us if you could let us know which airlines require you to book with the card to get the free checked bag, b/c that is really important for a lot of people, including moi. Also, if buying on a foreign airline, you are still buying in U.S. Dollars, aren’t you? When would the “foreign transaction” occur? I’d hate to get stung by that unexpectedly (and unnecessarily, since I certainly have cards with no f.t. fees, and would feel like an idiot if I just used the wrong card). @ mbh — Let me try to add the exact airlines to the post. In my experience if it’s charged in USD you’re fine without a foreign transaction fee, but if it’s charged in foreign currencies (as is often the case if you’re purchasing tickets between two foreign countries) then you’d be charged a foreign transaction fee. The US Bank Flexperks card also gives 2x for airline purchases, and those points can be worth *up to* 2 cents each as well. I would also factor in the additional protections some cards provide. I have found Chase’s benefits (including some automatic trip insurance and checked bag insurance) to be very helpful. That is what normally leads me to use the CSP v. the Amex Gold. I currently have (what I feel) is an insanely great United card – 3 miles per dollar on United ticket spend, 2 miles on some other stuff (can’t remember) and 1 mile on everything plus *and* 1 United elite qualifying mile for the first $5,000 I spend on United tickets – easy with my business travel schedule. I take that to be just as good, if not better, than any card listed above – I’m basically paying my $95 annual fee for a 5,000 mile flight, which is a pretty slick deal, plus a ton of regular old FF miles given all the business spend I put on that card. Given that I can use those miles on most of the awesome Star Alliance network…I’m pretty happy with that card. But I think it is no longer offered. Ditta on the travel protection. If it’s a very simple domestic itinerary, I’ll use the PRG/Busines Gold, but anything with a chance of disruptions goes on Sapphire. Except UA tickets if I need to check baggage, which requires the co-branded card for free baggage only. Would the CSP travel protection kick in if used on an award ticket to pay taxes/fees? @ Mason — Yep, sure does! Wells Fargo Propel World earns 3x on airfare. The points are in theory worth 1c, but apparently, some people are getting 1.5c per point on redemption for airfare. The AmEx Gold Rewards card caps the 3 x airline spend at $100,000 annually….are there any other Business Credit Cards which offer similar benefit….the Chase is a personal card? @ Gordon — Yes, the Sapphire Preferred is a personal card. The American Express Business Gold Rewards Card also offers 3x points for airfare purchases, for what it’s worth. How do you compare Trip Cancellation/Trip Interruption Insurance from chase Ink to CSP? Hey Lucky – can you clarify? : If I read your post correctly, if I were to purchase tickets on Alaska, you still think it would be better to use the Amex card? Is that because I would be getting 3x + 1(for booking through Amex) = 4 (vs. Alaska’s 3x miles)? Want to be sure I’m reading that correctly. Great post – very helpful! I like the Chase AARP card, as long as there is no FTF involved – 3% cash back on travel purchases. @ Kelly — With Alaska I can go either way. Personally I use the Alaska Card since their miles are so valuable, and I like purchasing tickets directly with Alaska so that I can easily redeposit the tickets as an MVP Gold. However, if you’re purchasing through the American Express portal you get 4x Membership Rewards points if using the Premier Rewards Gold Card, which could be worthwhile. Wells Fargo Propel gives x3 points for airfare as well. What about the MileagePlus Select that is no longer offered to new applicants but is a rollover from the pre-merger Chase United card? Penfed Airline Rewards card gives 8% effectively on airfare purchases. Work travel all goes on a corporate AMEX, but personal travel on the CSP for me! @ gwayrav – 99% sure that’s the card I mentioned above – I love it. With my Gold AmEx, I only get 3x airfare purchased directly from airlines, so going through the AmEx portal only gets me 2x points (1 point/$ + 1 bonus point/$ for using the portal). For this reason it is better to buy directly from the airlines. if i pay for the taxes/fees of an award ticket witht the CSP… no delayed baggage & other insurance? @ Mr. Cool — Nope, you still get those benefits even if just paying the taxes on an award ticket with the card. Citi Premier and Prestige are best for airline charges, so you can earn 2.5-2.67% back (or more with Prestige relationship bonuses!) toward airfare on *all* spend once you bank enough flight points by booking air tickets on the cards. @ Doug — Whoops, good point! @android @gwayrav, the current United Explorer card does not even compare to the old United Mileage Plus (Select or Platinum Class) that do 2X on gas, home improvement, grocery and dining purchases with up to 5000 EQM for united.com purchases! I think this is super lame, for the record, and it’s the only major complaint I have with the csp. thats good to know! and is in fact pretty lame. Chase Mileage Plus Select for united online purchases at 3x. As others have mentioned, unfortunately this card is no longer available. Great card, i will never get rid of it. Is this because of the return? For those of us using those cards to get Elite Qualifying Miles or MQD/PQD waivers, does it still make sense to put airline spend elsewhere and put some other category on these cards? @ Miles — If the card offers elite qualifying miles solely based on total spend, I’d generally put spend that doesn’t otherwise fall in a bonus category on the card. If you can’t reach that threshold without putting airfare on the card, it might make sense to do so. I’m with Miles, I’m running all purchases including flights on my Delta Reserve until I hit the $60K max spend for 30K MQM (x2 for personal and business versions). At that point I would agree on using another card like the CSP. Is there a blog about “best card” to use overseas for hotels and other expenses? I think Chase Sapphire will do the job but is there an issue with numbers not being imprintable (the old school way)? 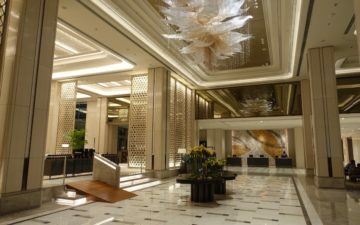 @ TTN — Chase Sapphire Preferred is definitely the best option in general, though I use Chase Hyatt Visa for Hyatt stays, since they offer three points per dollar. Numbers not being imprintable shouldn’t be an issue. @ stvr — I’m on it!